Despite failing miserably to uphold the Multipurpose Sports Complex of the College of Veterinary Science as a hub of sporting activities, the Assam Agricultural Universityon Tuesdayclaimed that it cannot say “no” to meetings in connection with the visit of the Prime Minister. The Registrar said many organisations would take pride for being a part of such activities. While taking pride in PM’s programmes, the AAU official was mute on the issue that the sports complex had turned into an exhibition ground during the last few years. When the AAU authority could not say “No” to PM’s meetings, the AAU official did not specify as to why it could not reject transforming the sports complex into a make-shift helipad and venue for auto exhibitions and religious congregations. Ranjeet Neog, Associate Director of Students Welfare (ADSW) of the AAU, in a reply to an RTI application, had held the BJP and Kamrup (Metro) district administration responsible for destruction of the sports complex at Khanapara. Copy of the letter sent by AAU authorities. Neog had said the standard twin cricket pitch at the sports complex, which was inaugurated in March 2011, is not in working condition now “due to earth-filling works by the BJP Assam Pradesh”. The ADSW had even said the BJP was responsible for destruction of the boundary walls of the sports complex at different places, and have not been restored. 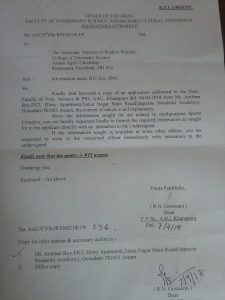 Caught on the wrong foot for blaming the ruling BJP for the destruction of the sports complex, the AAU Registrar claimed Neog was not authorised to reply to the RTI queries related to the sports complex. “…it has come to the knowledge of the AAU authority that (Dr) Neog did not study the RTI rules before furnishing the reply, as otherwise he is not authorised to do so,” the Registrar said. Surprisingly, the AAU official did not mention a word as to why the PIO (R.N. Goswami), who is also the Dean of the Faculty of Veterinary Science, did not reply to the RTI application on the multi-purpose sports complex. 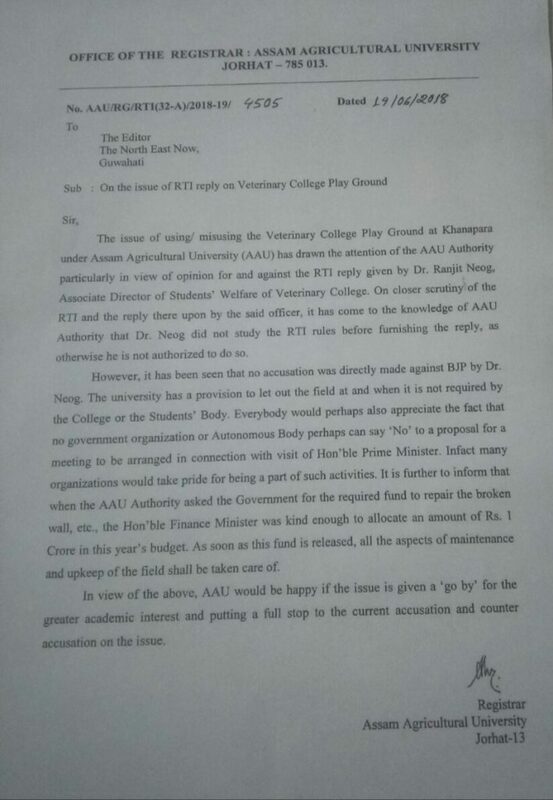 The Dean, in a letter (no: AAU/CVSc/RTI/62/18-19/ 236, dated April 7, 2018) to Ranjeet Neog, the Associate Director of Students Welfare, had asked him to furnish the information “directly” to the RTI applicant. A copy of the letter issued by the PIO, which is available withNortheast Now, clearly indicates that the ADSW is not at fault, and had carried out the responsibilities bestowed upon him by his superior. If Neog was not authorised to reply to any RTI application, why did the PIO direct him to do so? R.N. Goswami was appointed in February 2011 as the PIO, and it is surprising that in last seven years of his tenure, he did not know that the ADSW was not authorised to reply to RTI queries. 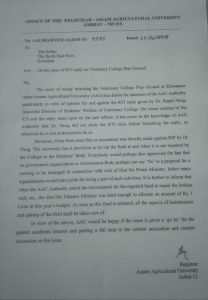 Analogous to PIO’s ignorance, the Registrar of AAU also exhibited his ignorance. He repeatedly named the College of Veterinary Science as “Veterinary College” in his letter to theNortheast Now. While common people often wrongly name the college, but, such a mistake by the Registrar of the university is definitely unexpected. Without any commitment to stop non-sporting activities in the sports complex, the Registrar informed that Assam’s Finance Minister “was kind enough to allocate” an amount of Rs 1 crore in this year’s budget, and the fund will be utilised to repair the broken walls of the sports complex. Assam governmenton Mondayused the multi-purpose sports complex as the venue for the “Bhumipujan” programme for the 19 upcoming cancer hospitals in Assam. 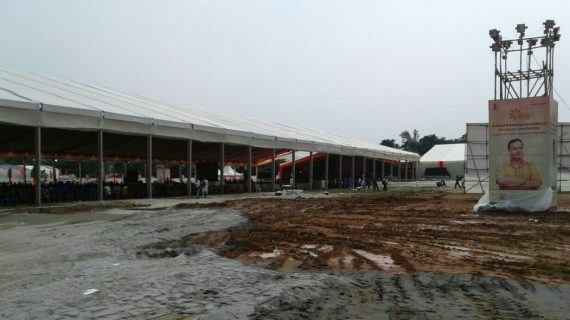 Because of the incessant rains for the last one week, the multi-purpose sports complex looked like a paddy field with trucks plying round the clock ferrying materials for construction of the pandal for the event. Why couldn’t the AAU authority commit that it would like to link the sports complex as a part of Chief Minister Sarbananda Sonowal’s dream project of establishing Guwahati as India’s Sports Capital?